Assistant Professor of Diagnostic Imaging at Thomas Jefferson University School of Medicine. Rabbi of the Young Israel of Hillcrest in Queens and an adjunct assistant professor of Biology at Stern College for Women of Yeshiva University. This event is approved for up to 15 credits by the Centre for Continuing Health Professional Education (CCHPE). The Centre for CCHPE, Faculty of Medicine, McGill University is fully accredited by the Committee on Accreditation of Canadian Medical Schools . This event is an Accredited Group Learning Activity as defined by the Maintenance of Certification program of the Royal College of Physicians and Surgeons of Canada. Through a reciprocal agreement between the American Medical Association and the Royal College of Physicians and Surgeons of Canada, the Centre for CCHPE, Faculty of Medicine, McGill University designates this activity for AMA PRA Category 1 credit(s) up to the maximum number of credit hours noted above. Each physician should claim only those hours of credit that he/she actually spent at the educational activity. Musical entertainment by Gershon Wachtel - Toronto-based pianist who has inspired audiences throughout the world with his program focusing on his amazing life and music. Visit him at www.gershonpiano.com . Shomer Shabbat Residency: Necessary, Desired, or Unnecessary? S eparate swimming hours on Thursday and Saturday night. Deluxe Spa (this has a fee but medical ethic attendees receive 20% discount) . "Yasher Koach, for a marvelous week end at Lake Placid. There wasn't a person who I spoke to, who didn't rave about every aspect of the programming." "It was the most exciting learning experience, that I have ever attended." "I left the conference on a total high. It was such a wonderful Shabbat experience. It was a Kiddush Hashem in so many aspects. The Torah learned, the Divrei Torah ,and being in the presence of true role models was a wonderful experience." 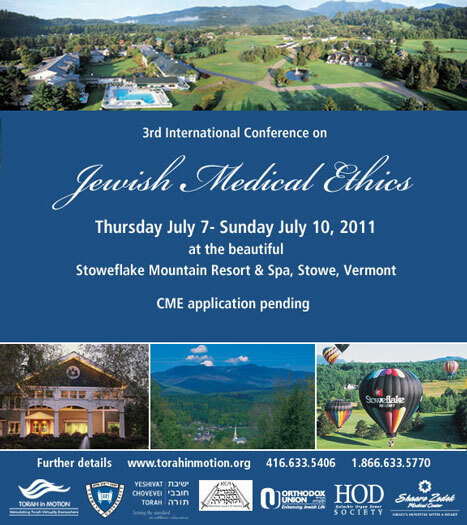 "I wanted to let you know how much I enjoyed the Jewish Medical Ethics conference last week in Lake Placid. I found the sessions and the networking opportunities to be very worthwhile. I look forward to the opportunity to participate in the conference in a more active way in the future."